Diagram used to determine the gate area of gray castings depending on the casting method. Figure 1 shows the diagram for calculating gate size for gray castings according to W. Schreitel. To determine the gate size, in addition to the casting weight, the casting height h (Figure 2) which is largely dependent on the casting method is significant . 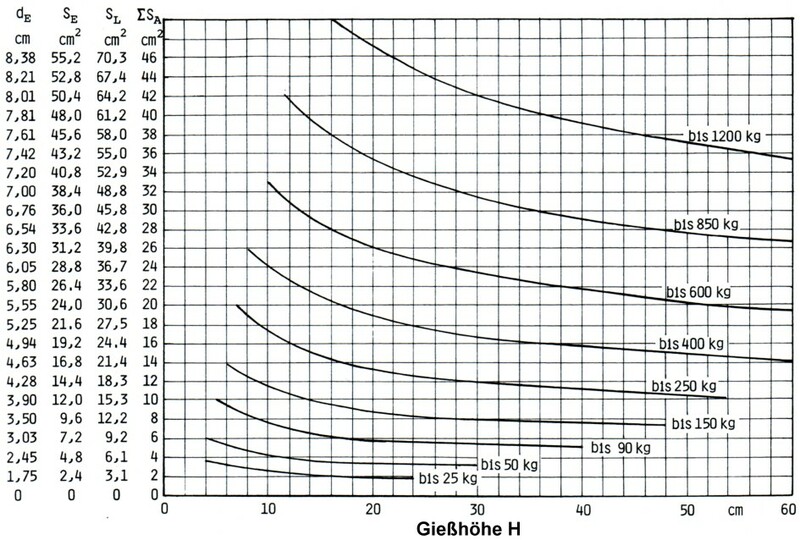 In Figure 1 , a vertical line is drawn from the x-axis with the corresponding casting height h to the intersection with the corresponding casting weight curve: this means the curve which currently corresponds to the corresponding casting weight. From this point of intersection, a horizontal line is drawn to the y-axis. The sum of the gate areas ΣsA can be read off the y-axis. In addition, the runner area sL, the downsprue area sE and the associated downsprue diameter dE for a gating ratio (downsprue:runner:gate) of 1 : 1.275 : 0.8 are given.